The maximum temperature on Sunday was 12.4°C (54.3°F) and the minimum 7.2°C (45.0°F). The maximum relative humidity was 100 per cent and the minimum 77 per cent. OUTLOOK FOR MONDAY: Fog in the morning. Cold wave conditions are prevailing in parts of Jammu and Kashmir, East Rajasthan and West Uttar Pradesh. Temperatures: Past 24 hours change: Minimum temperatures fell in Jammu and Kashmir, Rajasthan and West Uttar Pradesh and changed little elsewhere. Departures: They were below normal in Jammu and Kashmir, East Rajasthan and West Uttar Pradesh and normal in the rest of the region. The lowest temperature in the plains was 1.4°C recorded at Churru (Rajasthan). Forecast valid until the morning of January 1, 2002: Weather will be dry over the region. 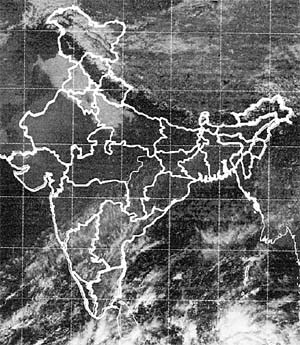 Forecast for Delhi and neighbourhood valid until the morning of January 1, 2002: Hazy sky. Fog during night and morning. Chilly winds to continue. No significant change in minimum temperature. Farmers weather bulletin for Delhi: forecast valid until the morning of January 1, 2002: Sky will be mainly clear.